An Arianespace Ariane 5 rocket launches into space on March 22, 2014 from the Guiana Space Center in Kourou, French Guiana, in South America. The rocket carried the Astra 5B and Amazonas 4A satellites into orbit. Kicking off a busy sequence of launches from Europe's spaceport in the jungle of French Guiana, an Ariane 5 rocket lifted off Saturday and put two satellites in perfect orbits to expand direct-to-home television programming in Eastern Europe and broadcast football matches at this summer's World Cup in Brazil. The heavy-lift launcher, weighing 1.7 million pounds with full fuel tanks, fired its hydrogen-fed main engine and solid rocket boosters at 2204 GMT (6:04 p.m. EDT) to climb away from the ELA-3 launch pad at the Guiana Space Center near Kourou, French Guiana. "Today's successful launch, the 59th in a row for Ariane 5, confirms the unrivaled reliability and availability of the European launcher," said Stephane Israel, chairman and CEO of Arianespace. "We take particular pride in being able to offer this service excellence to two leading European operators, SES and Hispasat, both long-standing customers of Arianespace, as well as the European Commission, which has an EGNOS satellite navigation payload integrated on the ASTRA 5B satellite. " The Ariane 5 rocket's upper stage engine was programmed to deliver the satellites into geostationary transfer orbit with a high point of 22,205 miles, a low point of 155 miles and an inclination of 3 degrees. The launcher appeared to hit its target, with its trajectory closely mirroring preflight predictions. Both satellites deployed from the Ariane 5 rocket on time, and SES and Hispasat officials lauded the successful launch in remarks delivered to VIPs in the Guiana Space Center's Jupiter control room. ASTRA 5B and Amazonas 4A are designed for 15-year missions. "For the [ASTRA 5B team], the operational phase is just beginning," said Martin Halliwell, chief technical officer of SES of Luxembourg, operator of the world's second-largest traditional commercial communications satellite fleet. "This is the end of the beginning. It has a long life, and they have an awful lot of work to do in the next weeks and months to bring this satellite into service." ASTRA 5B's on-board engine will circularize its orbit at an altitude of 22,300 miles over the equator, where it will appear stationary over a fixed position at 31.5 degrees east longitude. The fresh spacecraft is set to replace ASTRA 1Gat the 31.5 degrees east location. ASTRA 5B hosts 40 Ku-band transponders and six Ka-band transponders to expand direct-to-home television services over Eastern Europe, Russia and neighboring markets. "Its primary mission is the development of [direct-to-home] in Eastern Europe and in Russia," Halliwell said before the launch. "It's basically there to allow new entrants into the DTH world the opportunity to develop their platforms and start developing their business." The spacecraft, based on the Airbus Defence and Space Eurostar E3000 satellite bus, is flying with a hosted L-band navigation payload for the European Geostationary Navigation Overlay Service, which augments GPS navigation signals over Europe for specialty users such as the aviation and surveying industries. "EGNOS will be able to continue to provide valuable positioning services to users all over Europe, be it in the field of aviation, transport or agriculture," said Christoph Kautz, deputy head of the European Commission's enterprise and industry unit. Engineers plan to have Amazonas 4A in service by the June start of the 2014 World Cup in Brazil. The satellite will reinforce communications infrastructure to broadcast World Cup football matches and the 2016 Summer Olympics also to be held in Brazil. "With Amazonas 4A, we are going to respond to a double challenge," said Elena Pisonero, president of Madrid-based Hispasat. "First of all, [we are] trying to provide, in record time, additional capacity when it's required, and it's required for football, of course. We are going to do it with very innovative and high-quality services. We are going to be at the forefront of the revolution in the ultra high-definition." Amazonas 4A is the fourth Hispasat satellite focusing on Latin America. Launch activity in French Guiana will continue at a near-record pace over the next month, with the liftoff of a Russian Soyuz rocket scheduled for April 3 with Sentinel 1A, the first satellite for the European Union's flagship Copernicus Earth observation and environmental monitoring system. 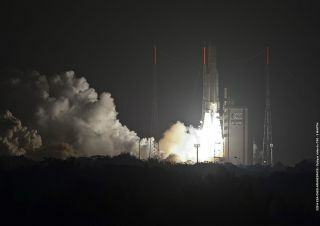 On March 22, 2014, an Ariane 5 rocket flight launched from Europe’s spaceport in French Guiana on a mission to place two telecom satellites, Astra-5B and Amazonas-4A, into orbit. Europe's lightweight Vega launcher is set to make its third flight as soon as April 25 with DZZ-HR, a high-resolution Earth imaging satellite for the government of Kazakhstan. The Ariane 5, Soyuz and Vega launchers use different launch pads but share some satellite processing facilities, making the task of juggling the manifest a balancing act. Arianespace plans 12 launches this year from the Guiana Space Center, which is known by its French acronym CSG. "We are now in a very busy period of time at Europe's spaceport," Israel said. "As a matter of fact, after tonight's mission's completion, there are still no less than four launch campaigns being conducted in parallel at CSG involving our entire launcher family: two on Ariane 5, one on Soyuz and one on Vega. I checked on these future missions this morning at CSG, and they are all on track." The next Ariane 5 launch is on track for late May with the Measat 3b and Optus 10 communications satellites for Malaysian and Australian operators.